What is the Drugsafe system? I started this design project with a question, “What does effective drug education look like?” After researching studies done in the 1980s on abstinence-only drug education programs such as D.A.R.E., it was clear that telling kids to “Just Say No” was never, and will never be, an effective way to prevent drug abuse among youth. I decided to create an educational tool that can serve as a either a supplement to traditional drug education, or a tool that can coexist with radical drug education. 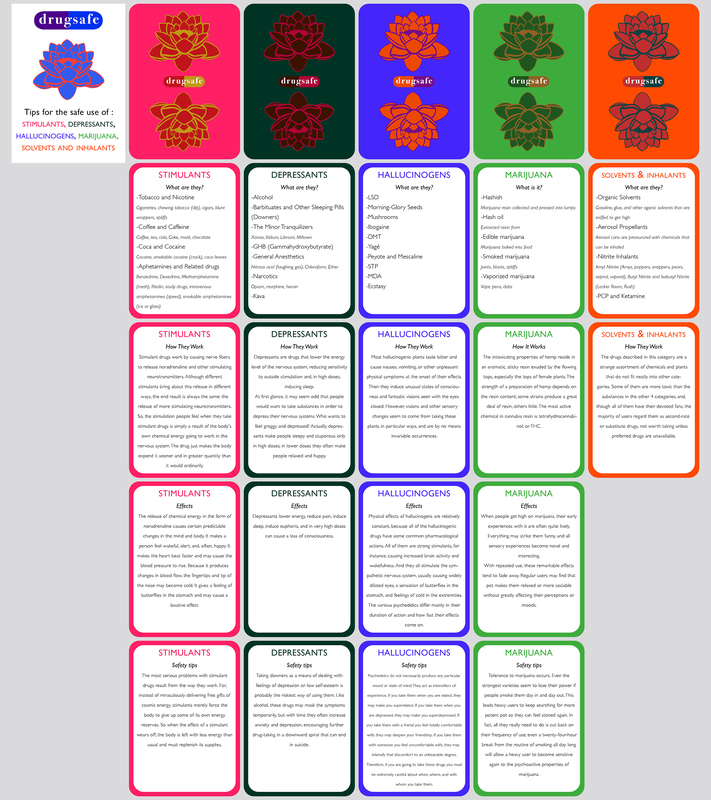 The purpose of my system, the Drugsafe cards, is to 1) provide people with an unbiased tool that demystifies drugs from caffeine to opium, 2) de-stigmatize certain drugs (such as crack, marijuana, and heroin) by separating the science of the drugs from pervasive stereotypes about drug users, 3) provide people with a reliable resource for drug safety information so that if they choose to use drugs, they can be aware of how the drug will affect their body and mind. My system echoes the philosophy behind what I believe is effective drug education: a thorough and unbiased guide to every drug, and the acknowledgement that teenagers have free will, and are not persuaded by punishment, lies, and horror stories about drugs. 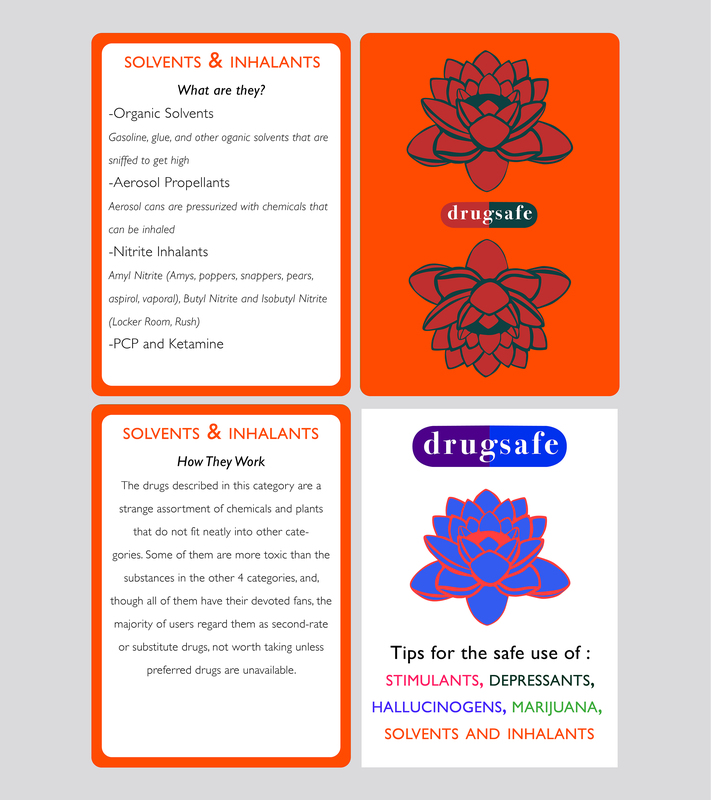 For the next iteration of this design, I will provide more graphic on the cards, as well as stronger parallels between the different categories of drugs. 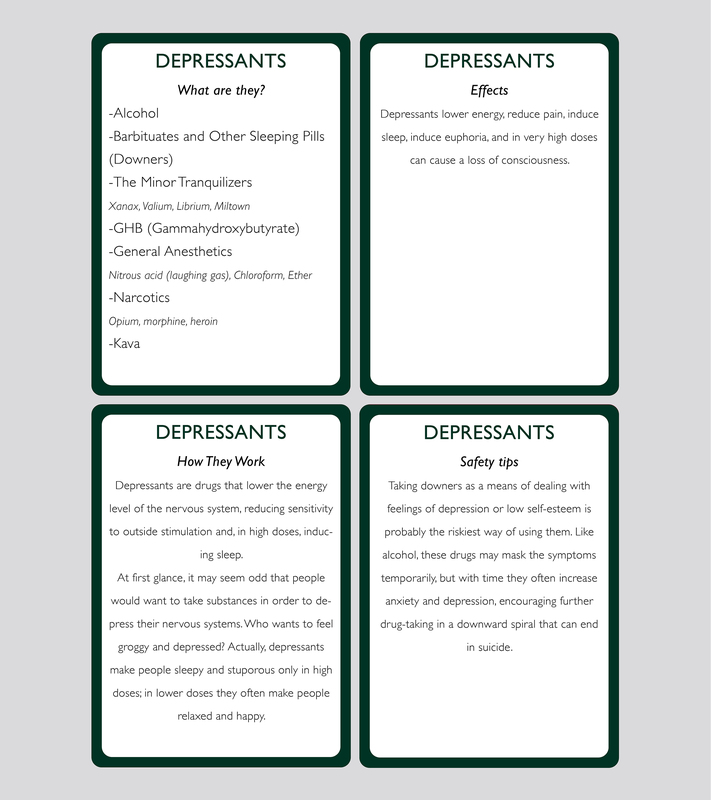 I will also cross-check the information on the cards with a more modern sources that describe the way drugs work. I also want to provide more modern street names for each drug. The main source that I used for the facts on my cards was From Chocolate to Morphine: Everything you need to know about mind-altering drugs. I modeled my approach to effective drug education after the Drug Policy Alliance’s pamphlet, Beyond Zero Tolerance. I positioned drug education within the context of the War on Drugs, watching the documentary 13th, as well as Ethan Nadelmann’s TED talk Why we need to end the war on drugs. My seminar paper is about the ulterior motives of the War on Drugs and abstinence-only drug education, and who/how the fight against drugs is hurting. This research helped me design my system because I learned about the larger oppressive constructs that dictate how kids are educated about drugs. The intended audience of my system is students in high school, because that is usually the period of time kids begin experimenting with drugs. The intended audience is anyone who is interested in learning about drug classifications, but it is also for casual drug users who might not be fully informed about the pros and cons of the drugs they are using. Because of the taboo of drugs, casual users are constantly hearing false information that perpetuates unsafe drug use. Drugsafe is a resource that doesn’t impose judgement, it only provides information. A meaningful sample size is 20+ students, but with all different experiences with drugs and drug education. It is important that the sample of students looking at my cards have varying knowledge about drugs, because I don’t want the cards to be either too difficult to understand, or so simple and obvious that the user feels patronized. Because I’ve attended school with many different types of kids, I was able to reach out to old classmates still in high school, the younger siblings of my friends, and my current friends to evaluate the Drugsafe cards. I was strategic about why I included each person–and I believe that I achieved a wide range of different students, in terms of racial, socioeconomic, and geographic diversity. In addition to the students, I also had my chemist sister give me feedback, as well as an acquaintance of mine who works in the marijuana industry on a policy level. I had my audience engage with the Drugsafe cards by viewing them, and then filling out a mostly open-ended survey about their effectiveness and places where they could be improved. I ensured that my sample was fully engaging with my model by asking questions that required explicit examples from my prototype. I do believe my engagement was meaningful, because I have collected enough feedback to have a clear idea of how to improve my design for the next iteration of the Drugsafe system. For example: I need to expand the content on my cards to cover overdose protocol, provide information about drug interactions, provide a wider range of side effects, include long term and short term effects of drugs, add data about safe dosage, and add graphics. I am evaluating the effectiveness of my engagement by the amount of concrete feedback I received that will cause me to adapt my system and make it better. I think I could have improved my engagement process by including more “experts” in my sample, such as educators, drug scientists, and card designers. It is sometimes difficult to get students to fully critique, so I feel like supplementation by people knowledgeable about the field might have given me more thorough notes for improving my system. I had a fun time with this project, because I was really interested and surprised by my research. It turned out that I didn’t know as much as I though I did, and in that way my system effectively educated me about drugs. I didn’t realize that coffee affects the brain the same way as a cigarette, or cocaine, or study drugs. I had no idea that cigarettes are more addictive than heroin, or that hallucinogens like mushrooms are relatively safe and non-addictive. I am confident that after this project, I will be educate my peers about honest, smart drug practices–and for me that’s a success in an of itself. On the other hand, my unexpectedly steep learning curve meant that I was a bit unsure about how thorough and accurate the information I put on the cards was. There is a lot of responsibility that comes with creating a learning tool, and claiming to be telling the “truth,” as some type of authority. 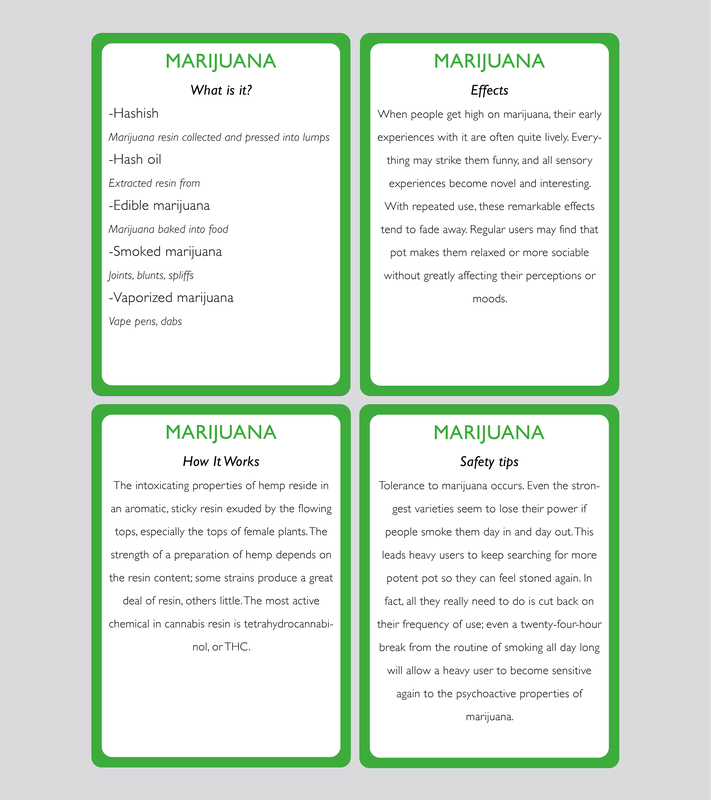 I think that ideally I would design the cards, but someone with experience in drug education (such as the founder of the Upfront radical drug education program) would write the facts to go on each card. My biggest challenge was figuring out how to organize the deck of cards. 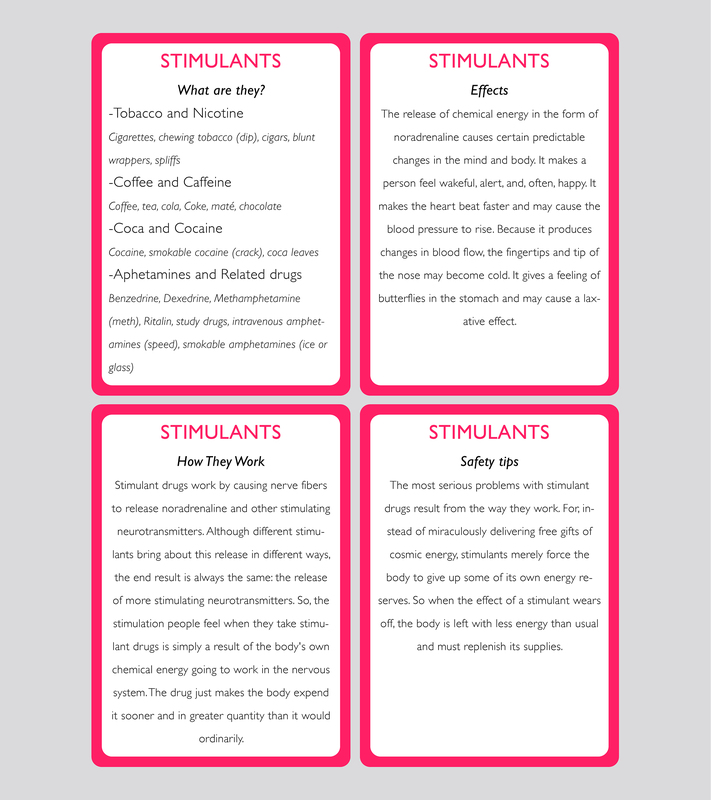 I ended up categorizing each drug under classifications such as stimulant, depressant, or hallucinogen, but some things didn’t quite fit under any given category. Or a drug like heroin would fit into so many sub-categories under depressant (narcotic, opiate) that I had difficulty figuring out how to format the card. 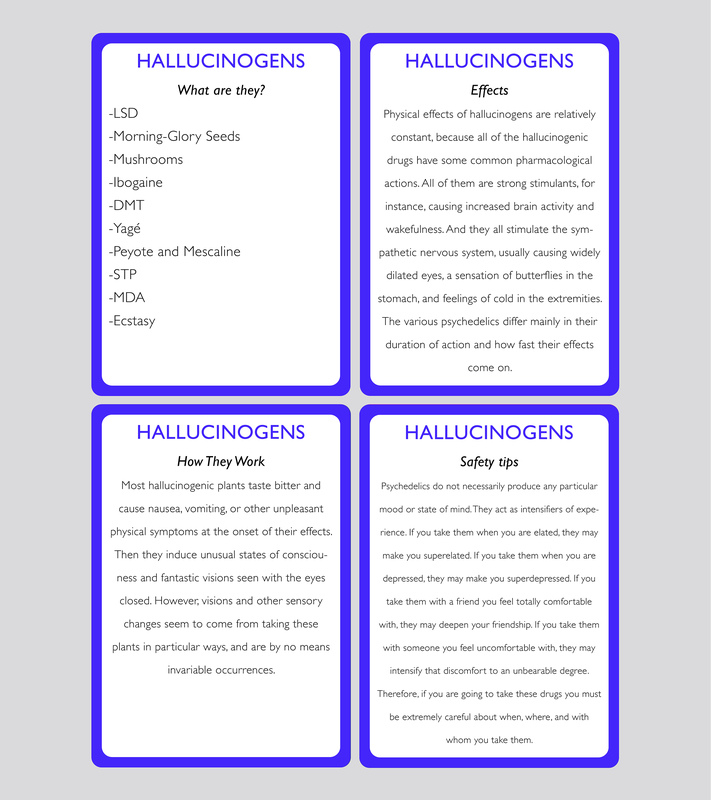 If I had more time, I would make a lot of more cards, so that I could get really specific about each drug and be more accurate, as opposed to placing each drug into a larger group, and only having information about the group as a whole.